As new technologies and manufacturing processes open the door wide to innovations in every field, the home renovation field benefits as well. From new materials to tools that will help get the job done right, the home improvement field has several new inventions worth taking a second look at. From the kitchen to the bathroom, there are multiple new products and inventions available to make your home renovation project go smoothly. Grout is one word that makes many homeowners hesitate when selecting their floor and wall coverings. This cement based product is well known to be porous and therefore susceptible to staining, mold and mildew growth. Enter Tec Grout's new AccuColor XT grout. Formulated to block stains and resist mold and mildew growth, XT grout is made to be even in color and resist fading as well. The grout mixes like other grouts with no additives, and is only slightly stiffer in application. Small bathroom renovations just got a complete makeover due to Neo-Metro's Neo-Comby. This stainless steel fixture is both a toilet and a pedestal sink. Made of 16 gauge stainless steel, the Neo-Comby is a curved, sleek pedestal with a built-in stainless steel sink bowl and single handle faucet. Placed off to one side and connected to the same pedestal base is the toilet seat. With additional storage located behind a sliding door and optional towel rails, the Neo-Comby can fit into the smallest bathroom, giving a whole new meaning to the words "water closet". 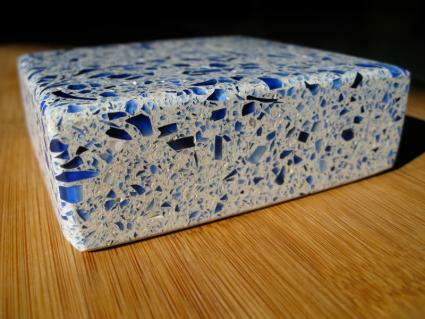 Eco-friendly building products are quickly gaining speed, and at the forefront is the recycled countertop. Made of recycled crushed glass and a colored resin, IceStone countertops cut and install just like granite. Customizable from a blend of colors, including the resin, IceStone counters can be installed in any kitchen. They are scratch resistant, burn resistant and chip resistant, and are one of the greenest ways to make over your kitchen. Love the idea of sitting out on a balcony on a beautiful evening, but don't have the ordinance for one? Consider installing a fold out balcony from BloomFrame to get the best of both worlds. Made of stainless steel and available in a wide variety of colors, these balconies attach to the window and lower down at a touch to form a durable and attractive balcony. The front panel of the balcony is the glass that was the upper part of the window, while the bottom is the section seated below the glass when the balcony is folded up. Once you're back inside, just fold it up again. Home renovations may be stressful and time consuming, but with these new products, they just got easier, more stylish and longer lasting. Give any of these products a try to improve your home.